Senner Chalet sits with a grandstand view of the mountain perched in private neighborhood just 2 minutes from the ski trails. Authentically constructed by European craftsmen the home bears murals and imported furniture that convey the cultural heritage of the owners throughout – right down to the cowbells hanging over the deck. Experience the delight and charm of an authentic Bavarian Chalet set in the mountains of Steamboat where the only thing missing from the picture might be Julie Andrews singing the Sound of Music! The cozy Great Room with heavy beamed ceilings and real wood burning fireplace is a central gathering room for living, dining, and entertaining for the week. The fully equipped kitchen provides everything that your group will need to dine and entertain at home. A full complement of appliances, utensils, and cookware will allow you to take advantage of staying in a home and not feel that you have to eat out on vacation. A large deck opens off the living room for outdoor grilling and enjoyment of the panoramic views before you. The dining table seats up to 10. Set adjacent to the kitchen you can enjoy delicious meals together to recap the adventures of the day on the mountain. On the main level the Master bedroom with TV offers a King bed with private bathroom. A recent remodel has added a 6th bedroom on this level with two twin beds and an adjacent private bathroom. 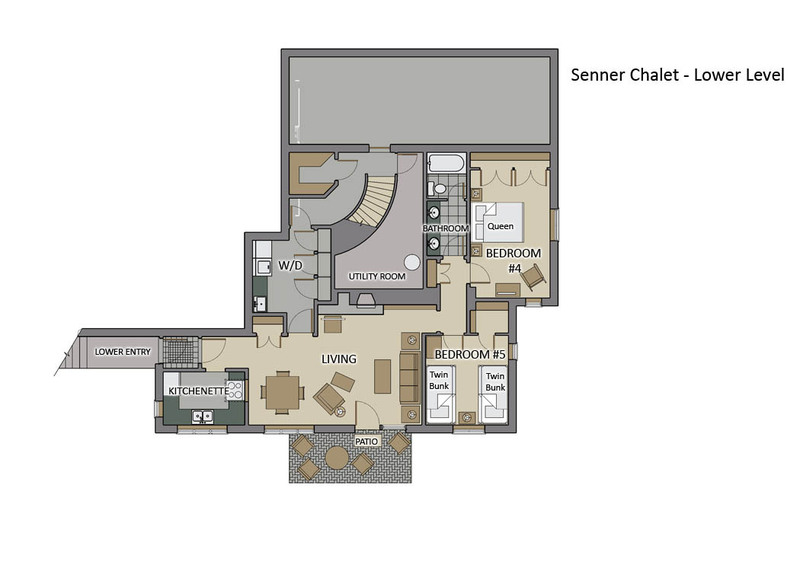 On the upper level there are two King bedrooms with TV that share a hallway bathroom. 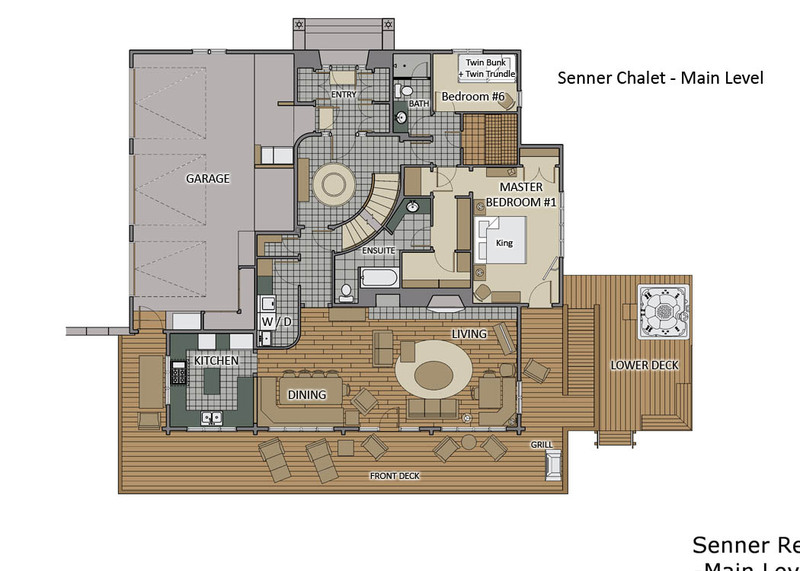 On the lower level there is one Queen bedroom and a bunk room with two sets of twin bunks that share a full bathroom. The chalet also offers a large steam room inside, and private outdoor hot tub for relaxing after a day of skiing and snowboarding. On the lower level the rec room also with wood burning fireplace provides an additional living area with a TV and Blu-Ray DVD player. 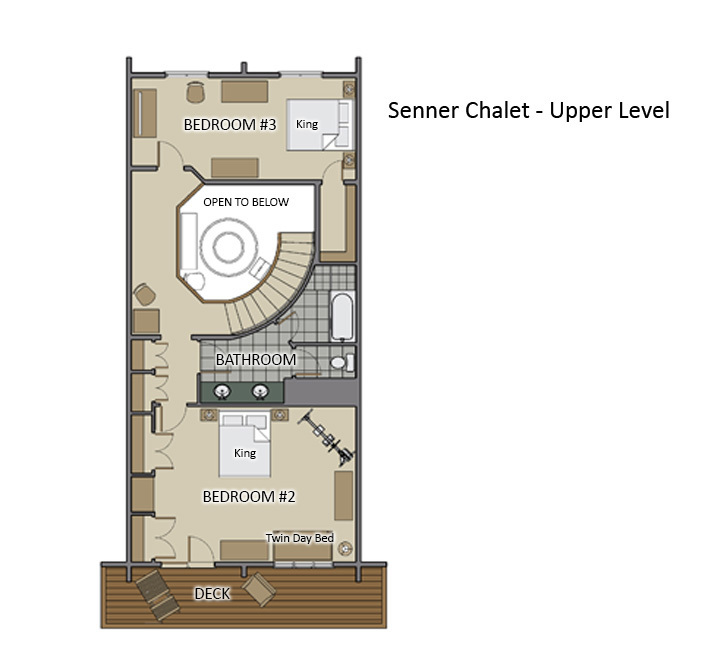 Senner Chalet also offers one heated garage parking space with ample driveway parking for 3 – 4 more, although vehicles are not needed in the winter as our complimentary shuttle service picks up from the driveway. Beautiful property and building! Very modern, and extremely spacious. You can't beat the views! Awesome Austrian style home. Everything worked great. Had a blast! Very nice house and comfortable. There was a dirty towel still in upstairs bath when we arrived and one of the downstairs doors was open. We did have to have someone bring a new gas tank for the grill. The extra one did not fit the connector to the grill. Of thing, the girl who checked b me in, Britt, said she was going to stop by at some point to drop off gift basket. Made me feel like she wanted to check up on us. She never did drop off a gift basket. We did not need a gift or expect it but she told us she was going to drop one off.